Michael Pineda has been suspended 10 games for using pine tar. NEW YORK — Baseball Commissioner Bud Selig says the sport will wait until after the season to study whether the rule preventing pitchers from using pine tar should be changed. 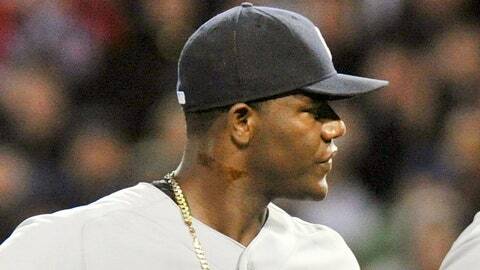 New York Yankees pitcher Michael Pineda was suspended for 10 games Thursday, a day after umpires found pine tar on his neck during a game against Boston. Pineda said he was trying to get a better grip on balls on a cool night, and pitchers say they suspect pine tar use may be routine — although usually discreet. Baseball rules prohibit pitchers from using foreign substances. "When the year is over, we ought to look at all this," Selig told the Associated Press Sports Editors on Friday. While Pineda appeared to have pine tar on the palm of his pitching hand during a start against the Red Sox on April 10, Boston never brought it to the attention of umpires that night. The Red Sox did point it out the umps Wednesday. "I think the way that the rule has been enforced, as with lots of rules in baseball, is that when there’s a complaint, we do something about it," MLB chief operating officer Rob Manfred said. "And that’s what happened here. I don’t think that this particular incident is all that different from other incidents that we’ve had in the past. We will like we do every offseason look at this issue, but remember, pine tar is one of a number of foreign substances, and you have to have a rule that fits for all of them. I don’t think there’s anything all that different about the Pineda." In other pine tar penalties, Tampa Bay’s Joel Peralta was penalized eight games in 2012, the Angels’ Brendan Donnelly 10 days in 2005 and St. Louis’ Julian Tavarez 10 days in 2004. The suspensions of Donnelly and Tavarez were cut to eight days after they asked the players’ association to appeal, and Peralta dropped his challenge with no reduction.